The much awaited latest version of Apple tablet device is now available at Mac Store in the Philippines. The good thing that we expect for this tablet is the price of it. 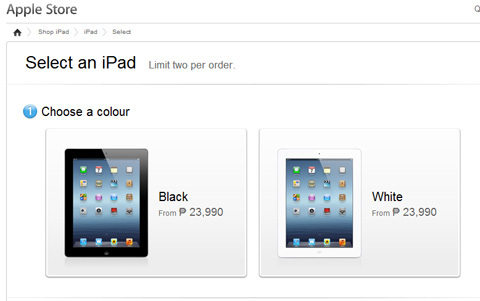 iPad 3 or iPad HD have the same price of iPad 2 when it first came in the country. iPad 3 comes with two colors, black and white, and its priced between P23,990 and P39,990, depending on the size of the memory and used of Internet connection. Meanwhile, the price of iPad 2 models have been changed. Starting with iPad 2 16GB Wi-Fi for only P18,990 and P24,990 for iPad 2 16GB, Wi-Fi and 3G. Comments or suggestions about "iPad 3 is now available in the Philippines" is important to us, you may share it by using the comment box below.